The summer in the UK is finally coming to an end, much to the delight to many gardeners across the country who have suffered a drought for many weeks. A drought is a nightmare for any keen gardener as plants will need even more love and attention due to the lack of rainfall and blisteringly hot sun. Unfortunately damage from droughts does happen – and the lawn is often what will suffer the worst as the damage is very clear. 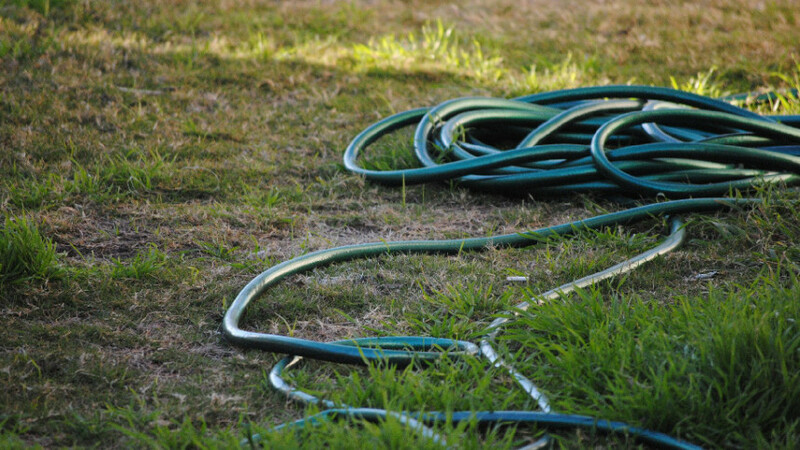 In this blog we will go over the signs and symptoms of drought damage to your garden and what you can do to get your garden green and lush once again. After a long drought if your lawn has not received sufficient water, you may see some dry & yellowed patches or in extreme cases, the lawn can become completely yellowed. Water! : Obviously during a drought, the garden is not getting any rainfall so ensure that you water thoroughly every day. One good soak each day will suffice. The best time is early in the morning before the sun gets too hot as this will allow the water to be fully absorbed before it is evaporated by the sun. Aerate the lawn: Use an aerator – or simply use a garden fork to punch holes into the lawn. This will help moisture get deep into the roots below the ground. Weed & de-thatch: With water already scarce, your lawn does not need weeds and thatch competing for precious moisture so now is a great time to get rid of any weeds that may be holding your lawn back. Mow: Keep mowing but keep the blades slightly higher than you would usually. Once the mowing is done, spread the clippings over the grass. This will help provide more essential moisture to the lawn - just don't over do it and leave clippings in large clumps as this could suffocate the turf. Apply fertilser: After the drought is over (approx 2 weeks) apply a light spreading of a balanced fertiliser to the lawn to aid and encourage growth. Be careful and read the instructions carefully as too much can actually do more harm than good. Why do turf rolls shrink? The reason why the size and weight of an individual turf roll can vary is because of the water content that is being stored within. When the turf is harvested – it immediately begins to slowly dry out over time, causing the turf to slightly shrink somewhat. As turf is a living product, time is of the essence. We harvest all of our turf to order in a race against the clock to get it delivered to your door as quickly as possible – usually next day delivery. Due to this process, we highly recommend ordering 5-10% extra when buying new turf for your garden. This will also ensure that you have plenty of turf just in case any rolls are damaged in transit. In new lawns, if the turf has not quite fully established you may see some shrinkage and have gaps between a few pieces of turf. In this case, your best bet is to apply plenty of grass seed along with some fertiliser and plenty of water. The lawn should be back to normal in a few weeks. For a quick fix or in extreme cases you could also get a fresh piece from a garden centre to plug the gaps.